The launch of a new show home in Droitwich has been hailed by Bovis Homes as one of its most successful in the region since the economic downturn hit housebuilding. The five-bed Arundel at Harrison Park on Worcester Road has received a flood of visitors since opening in May, following a large number of local buyers registering their interest with the Midlands homebuilder. "We've already had more than 200 visitors to Harrison Park and taken our first reservations," said Regional Sales Director Alison Tindle. "The showhome has gone down extremely well and in general there was a lot of positive local feedback that this brownfield site is being transformed into an exciting new part of the community. 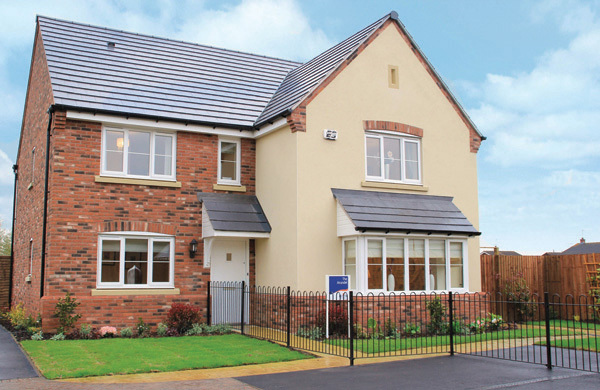 "Bovis Homes Central region have launched five show homes this year and Droitwich certainly had the busiest launch of them all, proving the great demand for what we want to do there. There is also a lot of interest in the later phase of the development which is still subject to planning. "The building of the homes is also great news for the local economy, helping to create jobs both directly and across the supply chain and the interest shown is a real sign that things are picking up in the industry and the market." Harrison Park has been named after a local First World War hero, Sergeant Ted Harrison, who was awarded the Military Medal for 'conspicuous bravery and gallantry in the field' in July 1917 before being killed in action in France. The name was thought to be particularly appropriate as the land used to be the site of the Army Medals Office. "We are still hopeful that a relative of Ted will come forward and maybe shed some more light on his history," said Alison. "We are committed to working with the local community, and having a member of his family involved with Harrison Park in some way would be extremely fitting. "We are certainly grateful for the community's tolerance and support as building has got under way and we will continue to work closely with them."